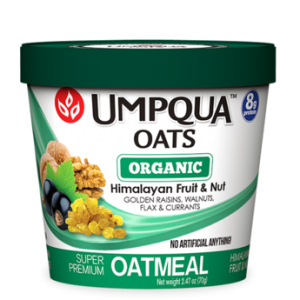 Organic Non-GMO Oatmeal cups for Healthy Lifestyles! A little tart, a little sweet, and all organic with cranberries, apples, almonds, raisins, flax seeds, and cinnamon. 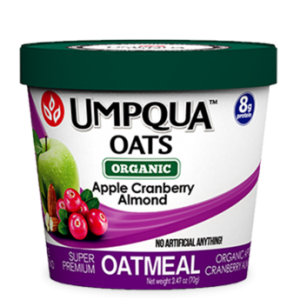 INGREDIENTS: Organic Whole Rolled Oat Groats, Organic Cane Sugar, Organic Cranberries, Organic Raisins, Organic Brown Flax, Organic Almonds, Organic Apples, Organic Cinnamon, and Sea Salt. Pack size: 12 x 70 g.
INGREDIENTS: Organic Whole Rolled Oat Groats, Organic Cane Sugar, Organic Freeze Dried Bananas, Organic Walnuts, Organic Cinnamon and Sea Salt. 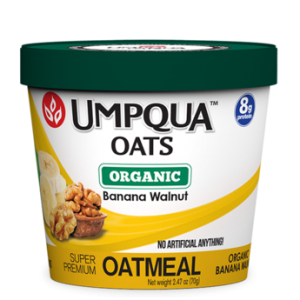 INGREDIENTS: Organic Whole Rolled Oat Groats, Organic Cane Sugar, Organic Himalayan Golden Raisins, Organic Walnuts, Organic Currants, Organic Sunflower Seeds, Organic Cinnamon, Organic Brown Flax and Sea Salt.